As a forager, this conversation occurs with mind-scrambling frequency. People say to me, if/when the apocalypse comes, I want you in my camp. It is funny to watch people shrink in disappointment when I tell them that I really enjoy my indoor plumbing, and if the zombies do come, I'm not sticking around. It's true that I possess many of these necessary skills for survival -- I can use a gun, start a fire, etc. But the reason that I forage is that I like good food, not because I want to be the last one standing should the world as we know it collapse. Plus, I likes me some internet. Seems like its a fairly popular practice these days to make the interwebs a scapegoat for our ills. But I will remain a strong defender of our electronic life. Let's not romanticize the days before the internet. Did any of us really enjoy hand-writing all of those postcards and letters as kids? I'm a shy girl (to those of you who are laughing, knock it off, I really am pretty bashful! ), and social media have helped me to cross the bridge into many meaningful flesh and blood relationships, both personal and professional. I can't even begin to imagine my life without the likes of fairy Beks, chief potion-producer at Kings Road Apothecary. She's been a presence in my life most every day since we met two years ago. I always think about the joy my Gran would have taken in being to speak with someone several states away (or on the other side of the planet), as if they were her closest neighbor, sitting in her kitchen. It is fairly often that Beks and I sit in the same virtual kitchen, telling tales of our plant-gathering and cooking up new recipes together. 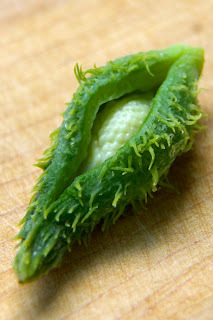 This week, by chance, we both made rhubarb and elderflower desserts, and decided to make them a joint posting. If you would like to see her delicious spin on this combination of spring ingredients, hop on over to Cauldrons and Crockpots, and enjoy her Rhubarb and Elderflower Custard Tart. Or, if you are in the mood for some pie, try a slice of this. 1. Line a standard pie plate with your pie dough, saving any excess to make cross hatches on the top of the pie. Refrigerate for 15 minutes. 2. 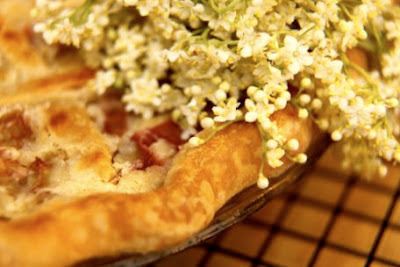 Fill the uncooked pie shell with the chopped rhubarb and elderflowers, gently tossing the two together with your fingers. 3. 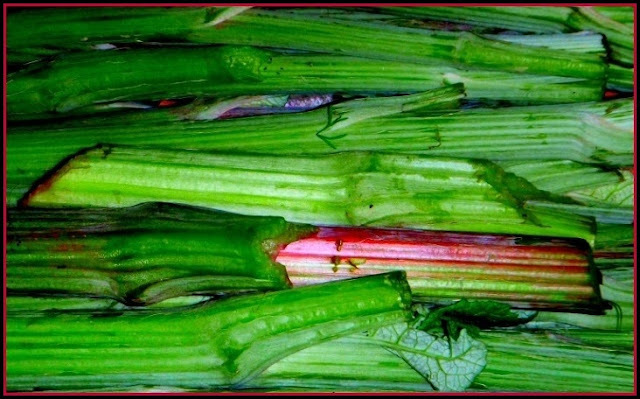 Use a wire whisk to combine the remaining ingredients, and pour them over the rhubarb and elderflowers. 4. If you had any scraps of remaining dough, roll them out, cut into at least 8 strips, and criss-cross them on top of the pie. Alternately, cut out shapes with a cookie cutter and place those on top of the filling. Or let it go nekked! Brush all exposed pie dough with a little cream, and sprinkle it with sugar. 5. Put the pie on a baking sheet, because if you don't, the filling will undoubtedly bubble over. Bake the pie on a low rack of the oven at 350 for 50 minutes. If the crust isn't browned at the end of that time, let it go under the broiler for a few minutes. 6. Let the rhubarb elderflower sour cream pie cool completely before enjoying it.